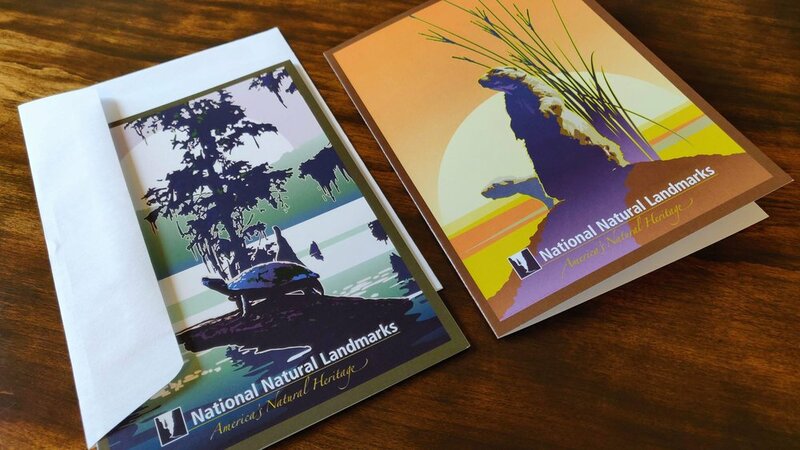 The National Natural Landmarks (NNL) division of the National Park Service has recently created notecards with newly created artwork to highlight America’s natural heritage. The first two designs feature Prairie and Swamp resource types, with more designs coming in the future. We’ve teamed up with our local Pacific West Region NNL coordinator to help spread the word of NNLs by sending out these beautiful notecards to our followers. Each notecard features artwork on the front, information about the natural area on the back, and plenty of white space inside to write away. We will also be shipping them with an envelope, so you’re able to mail a handwritten note to friends and family.